STORRS, Conn. - The season opener couldn't have been any more exciting. The battle of the Huskies provided little breathing room, as both squads traded blow-for-blow in the 62 minutes of game time. In a true game of inches, it was UConn who dealt the final blow. Just under two minutes into the overtime period, Nora Maclaine dished the puck off to freshman Camryn Wong who found the back of the net, giving the Huskies the 3-2 victory over St. Cloud State. Despite holding a 14-11 shot advantage, UConn found themselves trailing 1-0, thanks to a SCSU goal at the 10:38 mark of the first period. In the second period, UConn had plenty of early opportunities to tie the score but were unable to capitalize thanks to the play of the SCSU goalie. Then, with just under three minutes remaining in the period, Catherine Crawley netted her first goal of the night after receiving the puck from Natalie Snodgrass and Morgan Wabick, evening the score 1-1 heading into the third. Both squads got off to hot offensive starts in the third period, as SCSU regained the lead just 38 seconds into the period, before Catherine Crawley scored her second goal of the night off a power play to tie the game back up with just over 13 minutes remaining. From that point on, the defensive effort from both teams tightened up. neither able to capitalize on scoring opportunities late in the game, forcing the extra period. UConn's magic moment came 1:57 into the extra period. 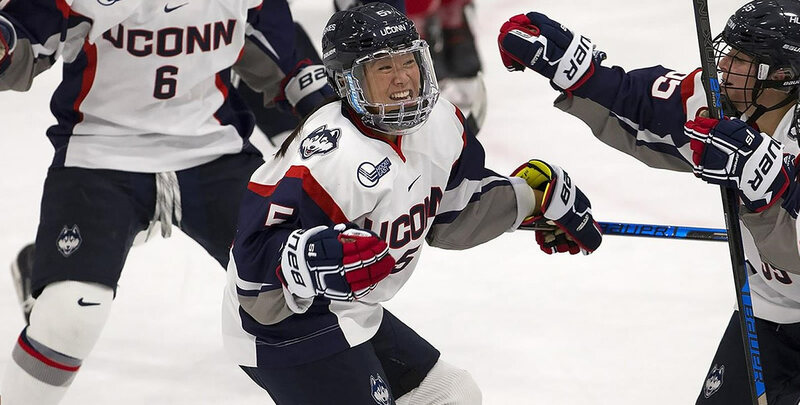 Taking advantage of a fast break opportunity, Nora Maclaine whipped a pass over to Camryn Wong, who delivered the knockout punch to SCSU with a goal that sent UConn home with the 3-2 victory! "I thought it was a hard-fought game. We really competed well and started to gel a little better as the game went on..." said sixth-year head coach Chris MacKenzie. "...I think we did a nice job of just staying with it. You have to play with the same effort for the whole game, and I'm really proud of our team for sticking to it." UConn completes the season-opening series with St. Cloud State before heading out on the road to take on Vermont in the conference opener.